If you’re in Australia and viewing [blogname].blogspot.com, you might be redirected [blogname].blogspot.com.au. A ccTLD, when it appears, corresponds with the country of the reader’s current location. This update will unfortunately cause a major issue with our Blogger Widget installation, where the same post will show different sets of comments depending on which ccTLD your readers visit. The good news is that Blogger sites using our Template installation are all set and will not be affected by this change. You don’t have to do anything, so kick back and relax. The not-so-good news is that if you are using our Blogger Widget installation, you will need to switch over to our Template installation to ensure that everything runs smoothly. It really is essential that you do this. If it weren’t, we wouldn’t bother you. Don’t worry, we’re here to help and we hope to make this as painless as possible. You won’t lose any of your existing comments if you follow the instructions below. Custom domains are not affected by this change. However, we would ideally like to discontinue our Widget installation. The Template install is much more stable, and future backend updates will most likely only apply for Template installations. We realize that it’s a pain, but it will be worth it in the long run. Next your will need to reinstall IntenseDebate using the Template installation method. 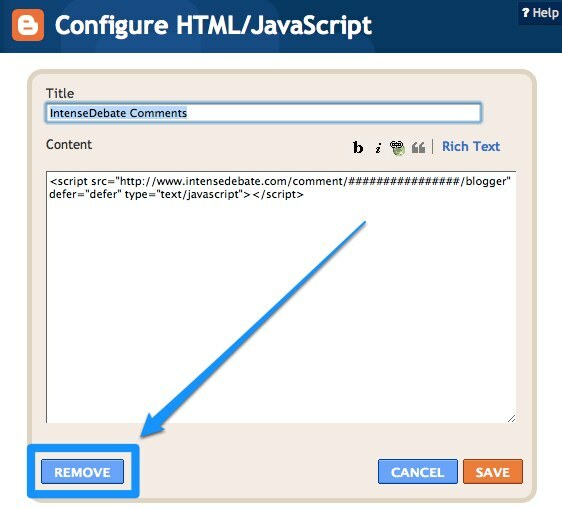 To do that go to your Blog Tools tab in your IntenseDebate account. Select Reinstall and follow the installation instructions. You should be all set. Again, we’re here to help. If you come across any issues, you can contact us here. Make sure you include the URL of your blog when you contact us. We apologize for the inconvenience and appreciate your understanding. For more information about Blogger’s ccTLD redirect change please check out their support documentation here. Just a quick note. If you are using our Facebook Connect integration, please update your Facebook Connect API Key in your Comment Settings and use your Facebook APP ID instead. Complete instructions are available in your Comment Settings page, and you can access your Facebook APP ID at https://developers.facebook.com/apps. You may need to clear your browser cookies and cache when you’re done. We have some great instructions on how to do that here. That should do the trick! Feel free to leave a comment with any questions about this change. Update – If Facebook Connect still doesn’t work after you update your API Key to use your APP ID, then it’s likely that you will need to refresh cache for your comments. The easiest way to do that is to post a new comment and that should force the cache to refresh. It’s been way too long since we last updated our blog – our apologies for the radio silence. I wanted to share a handy bit of CSS to help you further customize the way your readers can post comments to your site. While we offer a couple of different ways to comment – as a guest or using their Facebook, Twitter, WordPress.com, or IntenseDebate account – there wasn’t a way to disable guest commenting while still enabling Facebook Connect and Twitter Sign-in. But, as you may know, we offer a super-easy way to add custom CSS to bring your own personal style to IntenseDebate through your Custom CSS page. By adding a handy snippet of CSS, you can hide the guest commenter information fields (Name, Email, URL), which will effectively remove the option to post comments as a guest. I’m glad you asked. Currently commenters that post using Facebook Connect and Twitter Sign-in are considered guest commenters since they aren’t posting with an IntenseDebate or WordPress.com account. The issue is that if you disable guest commenting in your moderation settings by requiring readers to have an IntenseDebate or WordPress.com account, you would remove the options to post using Facebook Connect and Twitter Sign-in, which isn’t ideal. That last little bit adjusts the margin to make up for the hidden fields so there isn’t a gaping space where the guest commenter fields used to be. Feel free to tweak that as you’d like. Make sure you check out our CSS documentation, along with the rest of our guides to change the font size; text, background, and link colors; width of the comment section; and move the comment box to the top of the comment section.